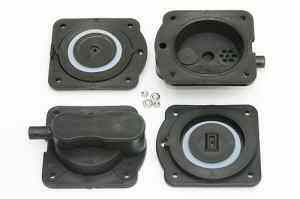 Our rebuild diaphragm kits are simple to install. Refer to our trouble shooting section for directions on proper replacement procedure. Note: If your diaphragms are blowing out frequently, you most likely have an excess back pressure problem in your design. Check that your air delivery tube is large diameter and no kinking is occuring. Check your air diffusers for clogging. Ceramic style air stones need cleaning with muriatic acid every 3 months typically. Check that the number of air diffusers is sufficient to handle the air output of your Hakko pump. Too few diffusers will create excess back pressure. Read the article titled "Heat Control for Air Pumps"